Dr Roy Lowry vodcating, a photo by foto_mania on Flickr. I spent a few hours this afternoon with Dr Roy Lowry, helping with the initial set up and positioning of equipment for a trial run of podcasting/vodcasting. Further details are provided in his recently awarded Teaching Fellowship, for which Dr Neil Witt and myself are listed as supporting staff. Dr Lowry wanted to not only produce a set of pre-laboratory podcasts to enhance teaching and learning, but also demonstrate how easily other teaching staff could achieve this using freely available (existing equipment) from our campus media services. This set up includes a standard MiniDV camcorder (of course the SD card or hard drive variety can be used). 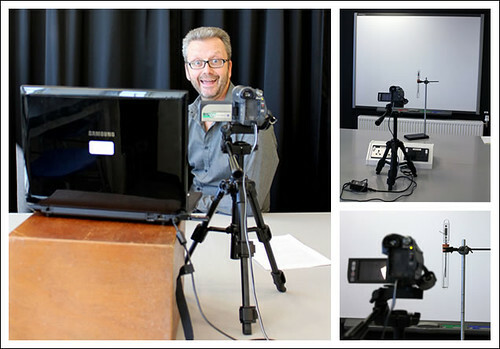 To simplify recording a mini-tripod was used so both presenter and equipment could be captured consistently. The laptop was used as an auto cue, providing prompts. Footage from both apparatus and presenter would be interwoven in editing software later. A very successful first attempt...I think the pictures speak for themselves! Sci-Tech Showcase 2011, a set on Flickr. I helped man one of the stands at the Plymouth University Science and Technology Showcase today. It was to promote materials for the Hydrographic Academy project I have been working on. Here are some random taster photos of the event! The green plastic objects in the photos above were actually created in a 3D printer, incredible what the students are doing here at Plymouth - of course not forgetting all the diving, computers and robots! I attended a meeting today to help the Hydrographic Academy's team obtain professional accreditation for their courses. This essentially involved presenting all of our ideas, examples of content to a member of an accreditation body. In this case it was Gordon Johnson from the IHO, who kindly visited us in Plymouth to discuss options and the way forward. Richard Thain provided details of the course structure, and I backed this up with demo's of the learning technology we would be using, such as the user interface, podcasts and communication method between tutors and students. It was a team effort where everyone contributed, Don Venture (Fugro International) flew out from the USA especially to participate in the meeting and we even had two people from the Royal Navy. More details are available on the Hydrographic Academy blog. I think this meeting somewhat highlights that Learning technologist often work on many levels, it's not just about technologies, but it's also about trying to link all the elements of teaching and learning together around the technologies. For those that are interested, the photos were shot on a Canon 550D with a standard 18-55mm lens and no flash (ISO 1600), the photo collage was then compiled in Photoshop CS5.